Why maintain a well-stocked pantry? It’s the secret weapon of a functional, well-organized kitchen! Stocking your pantry with quality ingredients is the first step in becoming more organized at mealtimes, saving time and energy in the kitchen. Each family’s pantry essentials will vary according to their personal preferences, dietary needs, and standard of living. Having a myriad of ready-to-use ingredients in your pantry will also help you be inspired to try new recipes—since you’ll have the resources to follow through with them—and more inclined to steer clear of processed and prepackaged foods. Doing so will ensure that you provide baby and the family with healthy, homemade meals on a regular basis. To ensure you provide a balanced diet, pair staple pantry items with fresh ingredients such as Greek yoghurt, fresh fruit and veggies, lean meats, and fish. Make a note of ingredients and foods that your family eats on a regular basis. Review your grocery list. If you buy it, use it, and it can be stored for an extended period of time, it’s a pantry candidate! Stock your pantry with frugal finds to lower grocery costs. 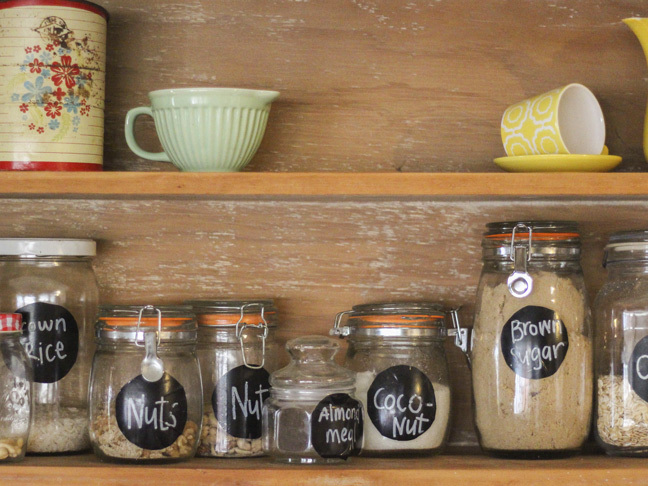 Buy twice as many of a pantry item that you purchase for weekly use, then store the extras. Canned legumes and beans are an easy way to incorporate fibre and protein into baby’s diet. Extra virgin olive oil adds flavour to meals, aids in digestion, and is rich in omega-3 fatty acids. Extra virgin coconut oil is an omega-3 rich alternative to butter in baked goods and has a sweet, creamy consistency. Quick-cooking grains (quinoa, couscous, millet) are quick and easy to prepare and lend well to a variety of condiments. Whole grain pastas and rice are a fiber-rich option to serve baby as opposed to refined pastas and rice. Dried herbs and spices add flavour without using additional salt in recipes. Organic low-sodium broth can be used to make a simple soup or to add to defrosted foods to rehydrate them. Dried fruits (and nuts for babies twelve months and older) add texture to yoghurt parfaits and muesli, or can be served as a chewy, healthy finger food. Canned tomatoes are ideal to keep on hand to make a simple tomato sauce or bolognese sauce. Lisa Codina is a working mum, fitness fanatic, recipe developer, and self-professed foodie. She is the author of Baby Bites: 50 Healthy Recipes for Baby and the Family and the founder of the Blog Bites for Foodies, where she shares clean eating recipes for the family and blogs about daily life with her Italian husband, two mini foodies, and summer holidays in Sardinia, Italy. She prides herself on providing her family with nutritious meals that focus on clean eating (i.e., gluten/dairy/refined sugar-free) that nurture adventurous palates and encourage a healthy lifestyle. You can also find Lisa as Bitesforfoodies on Instagram, Twitter, Facebook, and Pinterest.